Buy the book direct online from PM Press. 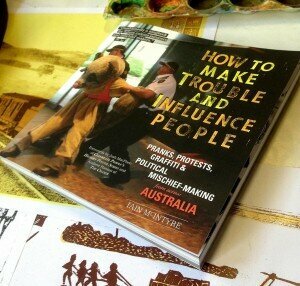 This book reveals Australia’s radical past through more than 500 tales of Indigenous resistance, convict revolts and escapes, picket line hijinks, student occupations, creative direct action, street art, media pranks, urban interventions, squatting, blockades, banner drops, guerilla theatre, and billboard liberation. Twelve key Australian activists and pranksters are interviewed regarding their opposition to racism, nuclear power, war, economic exploitation, and religious conservatism via humor and creativity. Featuring more than 300 spectacular imagesHow to Make Trouble and Influence People is an inspiring, and at times hilarious, record of resistance that will appeal to readers everywhere. 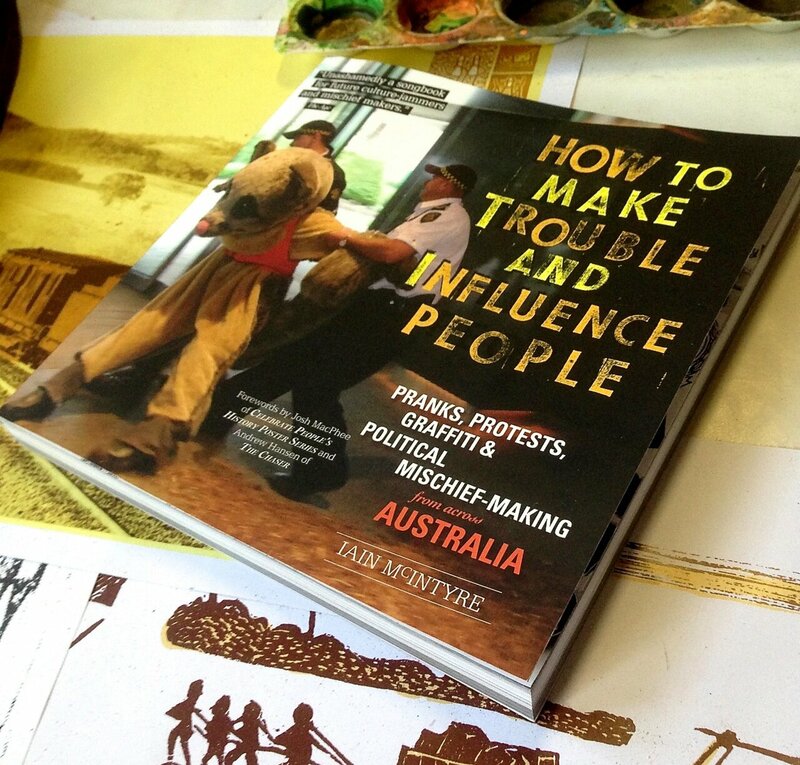 The expanded Second Edition of How to Make Trouble and Influence People co-published with amazing US radical publishers PM PRESS is here! PRINT: “BROKEN BUT BEAUTIFUL” Hand-printed woodcut print by Ned Sevil (printed by me in February, 2012). Come celebrate the 32-page broadsheet featuring a powerful collection of 30 posters for peace. 361 Sydney Road, Brunswick VIC 3056. Come collect your free copies of the publication! Show runs until 28th August. The 2010 Breakdown Poster Series contains 30 new, original and provocative political posters and poetry. FEATURING POSTERS by Colin Matthes, HA-HA, Ann Newmarch, John Emerson, 7U?, Kathleen McCann, Olaf Ladousse, Lluis Fuzzhound, Marc Martin, Marc de Jong, Caitlin Poduska, M.P. Fikaris, Van Rudd, Iain McIntyre, Stewart Cole, Aris Prabawa, Tom Civil, Rasool Parvari Moghaddam, Mathew Kneebone, Erik Ruin, KA’a, Bretton Bartleet, Arlene TextaQueen, Lou Smith and Tom O’Hern. And poetry by Ocean Vuong, Anwyn Crawford, Mammad Aidani and Opal Palmer Adisa. Breakdown Press first created a ‘poster series’ in the form of a newspaper in 2006 to coincide with the Indigenous-led protests and convergence at the Commonwealth Games in Melbourne. The series was titled The Stolenwealth Poster Series, with artists looking at the issues of Genocide, Sovereignty and Treaty. In 2006, we initiated The Breakdown Posters addressing issues of corporate globalisation, coinciding with the G20 protests in Melbourne. The Nuclear Posters, in 2007, investigated the nuclear industry in the lead-up to the Federal Election that finally kicked John Howard out for good. Now we’re very proud to be presenting our 4th Breakdown Poster Series – The Peace Posters. Breakdown Press, a Melbourne-based publishing outfit with a background in zines, street art, and activism has published a free, 32-page broadsheet featuring posters for peace. The aim of the The Peace Posters, the latest in Breakdown’s ongoing poster series, is to create compelling designs that promote peace and get them in as many bedrooms, offices, and public places as possible. The poster is an enduring art form that continues to capture our imagination. We are very excited to have been able to include artwork and writing not only from across Australia, but also from Iran, USA, Spain and France, and also by people whose lives cross many borders. We believe there is much hope to be found in playfully creating solidarity around the world, to build peaceful autonomous alliances that traverse governmental borders. Actions against war and towards the building of a peaceful society couldn’t be more relevant today. Especially considering not only Australia’s involvement in conflicts overseas (the war in Afghanistan has been raging for nine years) but also the involvement of Australia in the manufacturing of war machines, the use of Australia as a centre for US military bases, and the everyday injustice faced by Indigenous Australians particularly in areas under the Federal Government intervention. One featured poet, Mammad Aidani, says he hopes that people reading his work “reflect deeper that war and hatred are not the solutions for our problems in this violent world, and recognise that peace, human rights for all and freedom are the only ways which can unite us. We need to respect, care, recognise and learn how to live together regardless of who we are, what we believe and where we come from. We have a long way to go, but we must never lose hope and determination and work as hard as we can to make this dream possible. We are able to organise high res versions of the images for re-publishing and/or interviews with featured artists. Act boldly for peace – We need your help to distribute The Peace Posters in your local area! The Peace Posters is a 32 page BROADSHEET NEWSPAPER which unfolds to 30 posters and available for FREE … Released very soon! Please help us to cover our international postage costs. Thanks so much for your support! These prices are pay what you can, and are for International Air Mail. For Sea Mail which can take 2-3 months prices are $20 for 5 copies, $35 for 10 copies, $100 for 40 copies. For the moment postage in Australia if free, but if people or organisations can contribute prices are $10 for 5-10 copies, $22 for 40 copies.